Shri R K Mathur assumed charge as Defence Secretary on Saturday, May 25, 2013 (2), a photo by Chindits on Flickr. 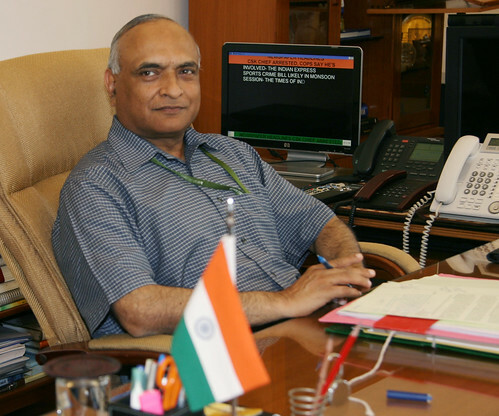 Shri R K Mathur, took over as the new Defence Secretary here today. He belongs to the 1977 Batch of the Indian Administrative Service of Manipur-Tripura Cadre. He did his B.Tech from IIT Kanpur, M. Tech from IIT Delhi and MBA from International Centre for Public Enterprises, Ljubljana. Shri Mathur has a rich and varied experience in the field of public administration and has held many important positions in the Government of Tripura. He has served as Principal Secretary in the Agriculture, Rural Development and Finance Departments of the Government of Tripura. He has also held the position of Chief Secretary of Tripura. During his different stints at the Centre, Shri Mathur has served as Development Commissioner (Handicrafts); Joint Secretary in the Ministry of Textile and as Additional Secretary and Special Secretary in the Department of Defence, Ministry of Defence. He has held Secretary level postings in the Ministry of Micro, Small and Medium Enterprises and Department of Defence Production, Ministry of Defence.